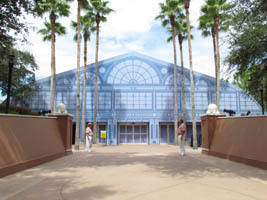 We attended the pin event “The Florida Project” at Epcot’s World Showplace pavilion this past weekend. 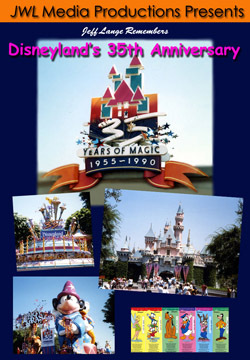 We are big fans of Disney history, and were looking forward to all the props (and merchandise) that were part of the event. 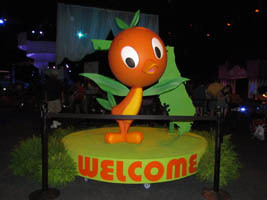 The Orange Bird (below, right) had a significant presence at “The Florida Project“, including welcoming guests as they arrived. The walls came down around Space Mountain today, and it is very close to opening! You can see the front of Space Mountain and the arcade (below, left), and the bathrooms in the former Skyway building are open as well (below, right). I am still working on my Disneyland updates, including photos and video from the recently enhanced Main Street Electrical Parade now appearing at Disney’s California Adventure! In the meantime, here are some photos from Walt Disney World yesterday. 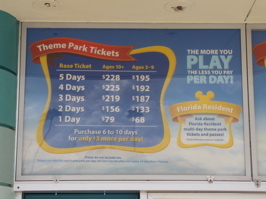 Both Walt Disney World and Disneyland raised prices on Sunday. New prices are listed (below, left). 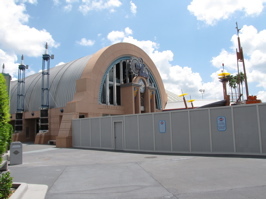 In Tomorrowland at the Magic Kingdom, the demolition continues on the old Skyway building. A larger area is now fenced off, including around Space Mountain and the Arcade (below, right).